Diane McDaniel will never forget the phone call she received on her birthday in 1968. The conversation offered the best present she could have imagined—and one that affects her life to this day. Her Glenville high school principal was on the other end of the line with news from Baldwin Wallace College. The school had a scholarship for minority students, and he wanted to recommend her. To her delight, she began her undergraduate career that fall. The financial assistance did not simply make attending college easier: It made it possible. McDaniel was in the top 10 percent of her graduating class, but her family lacked the resources to pay tuition. A brief conversation with her principal opened up an option that changed her post-high-school plans altogether. Having obtained her bachelor’s degree, McDaniel wanted more—her MBA. Once again, the support she needed appeared. Chuck Ames, then-CEO of Acme-Cleveland Corporation and McDaniel’s boss, learned that she had applied to a local MBA program. Ames, a longtime friend of the Weatherhead School of Management, asked why she hadn’t applied to the school he considered the best in the region. McDaniel indicated that the cost of tuition stood in her way. Nevertheless, she applied to Weatherhead. A few months later, McDaniel learned she had been accepted into the Executive MBA program—and her employer covered the cost. After 25 years at Acme-Cleveland Corporation, where she progressed from personnel clerk to vice president of human resources, followed most recently by eight and a half years as director of human resources at Cleveland Metroparks, McDaniel is now retired and recognizes the pivotal role that help from mentors played in advancing her academic and professional aspirations. Immediately after graduating, McDaniel began supporting Weatherhead both with her dollars and her time. She received the Weatherhead Outstanding Alumnus Award in 1993 for her years of service, leadership and financial support to the school. But she wanted to do more. Reflecting on her past, McDaniel decided that she wanted to support the next generation of minority students. Financial support had been the deciding factor in her educational pursuits, so it made sense for McDaniel to back student scholarship at Case Western Reserve. “I always thought that you needed millions of dollars to set up a scholarship,” says McDaniel, who was happy to learn that this was not the case. 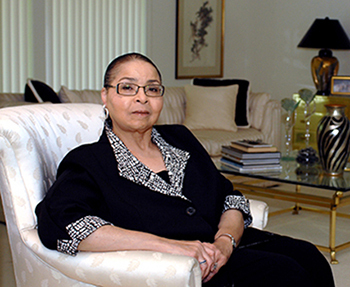 With a bequest of $50,000, she worked with Weatherhead’s development team to establish the Diane O. McDaniel Endowed Scholarship Fund, which will be used to provide merit scholarships to African-American and Latino students studying in the MBA or Master of Science in Positive Organizational Development (MPOD) programs. McDaniel was offered life-changing opportunities by people who saw her potential and offered her financial support and encouragement. She’s excited and proud that her legacy will allow her to do the same for others. Learn how you can invest in Weatherhead students. Visit weatherhead.case.edu/support.